Thomas Jorgensen in action for Panthers. 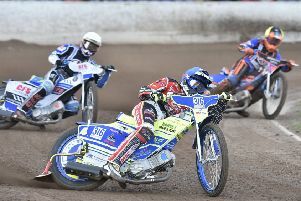 A floodlight failure at Rye House, which plunged more than half of the Hertfordshire track into darkness, led to their clash against Lakeside being halted after eight races. 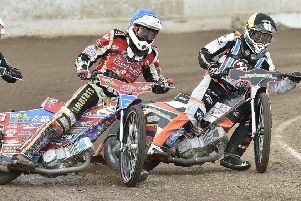 Patched-up Panthers – using four guests and only two of their own riders - trailed 34-14 at the time after being powerless to prevent the Hammers reeling off advantages – three 5-1s and four 4-2s - in the opening seven heats. Lakeside led by 22 points on aggregate after triumphing 46-44 in the first leg at the East of England Arena a fortnight ago, but British Speedway Promoters’ Association (BSPA) rules dictate that at least 10 races must be completed in any meeting for the result to stand. Frantic attempts to repair the lights and other solutions – such as using the headlights of riders’ vans to illuminate the track – were attempted but referee Dave Robinson refused to allow the meeting to continue on safety grounds. Panthers owner Ged Rathbone said: “We sympathise with the position Lakeside were left in, but it was not the fault of Peterborough that the meeting couldn’t be completed. “We certainly weren’t pushing to have the meeting abandonment. We would have happily continued if the lighting problems could be solved, but sadly that wasn’t the case. “Even though things weren’t looking good for us, we weren’t mathematically out of it and we fully expect the meeting to be re-staged although we can’t say when that might be at the moment. Panthers conceded a hat-trick of 4-2s before three 5-1s followed as Lakeside took command. The Hammers collected another 4-2 in heat seven before their hot streak was eventually ended by a 3-3 in a re-run eighth contest after home reserve Alfie Bowtell crashed out of the initial staging. Panthers also looked up against it in heat nine with reserve guest Carl Wilkinson being excluded for a tumble in the initial staging. Lakeside rider Adam Ellis then went down in the first bend of the re-run, but the third attempt to complete that race never went ahead as the floodlight issues flared up. Lakeside have appeared to use a shortage of available dates as a reason to hint they should be awarded a place in the play-off final. A statement issued by the Hammers late last night confirmed: “As notified to the British Speedway Promoters’ Association last week, we only have two days left available to us from the Rye House stadium owners (being next Saturday and Sunday) to complete the 2018 season. Last night’s floodlight failure came only three weeks after a second leg clash between the two sides in the semi-finals of the SGB Championship Shield at Alwalton was also held up by the same issue. On that occasion Panthers were able to erect temporary lighting with the help of their East of England Arena landlords to ensure the meeting was completed. LAKESIDE: Zach Wajtknecht 6+1, Richard Lawson 6, Adam Ellis 6, Nick Morris 6, Ben Morley 4, Kyle Newman 3+1, Alfie Bowtell 3+1. PANTHERS: Simon Lambert 4+1, Emil Grondal 4, Thomas Jorgensen (guest) 2+1, Tero Aarnio (guest) 2, Nico Covatti (guest) 1, Carl Wilkinson (guest) 0, Rider replacement for Bradley Wilson-Dean.